It feels as if the entire North American West is on fire, from northern Canada to our southern border. Dirty August is here, with the air often filled with smoke from nearby wildfires. In Meadows Valley, both the Mesa Fire east of Council and the Rattlesnake Creek fire to the north near Pollock keep the air smoky. But the past couple of days brought added concern as the Rattlesnake Creek fire quickly grew to the south of its earlier perimeter, increasing the range of Level 2 – be ready to leave on a moment’s notice – warnings to residents as far south as Smokey Boulder Road. That had me eager for more detailed information beyond what the Adams and Idaho County Sheriff’s Offices Facebook pages were providing. Trying to track a fire’s perimeter using maps published on websites like InciWeb and comparing them to one’s paper Forest Service map is challenging. Reference points used by InciWeb and county sheriff’s offices, such as mile markers on Highway 95, don’t appear on the FS maps. Sometimes only small lakes or creeks noted on both maps provide useful reference points. Searching various websites for detailed information about the Rattlesnake Fire, I found lots of informative and interesting maps and resources. The following are screenshots taken from the websites, current as of today, August 18, 2018. First, from InciWeb, an overall map of current fires in Idaho. Visiting the website, you can click on a fire icon for more information about an individual fire, including maps, photos, closures and notices. Next, four screenshots taken from a time lapse video showing the progression of the Rattlesnake Creek Fire from the National Interagency Fire Center’s ArcGIS group. The date of the fire’s perimeters is at the bottom of each image and they show why there was suddenly a lot of concern after the night of August 16th when the fire grew quickly southward. (For reference, the horizontal black line through the middle of the fire (orange) is the Adams/Idaho Counties line and the light gray line running vertically to the right of the fire is Hwy 95.) The access the video, click on the Fire Progression tab at the website link above. A portal to OSPO’s hazard mapping is here. 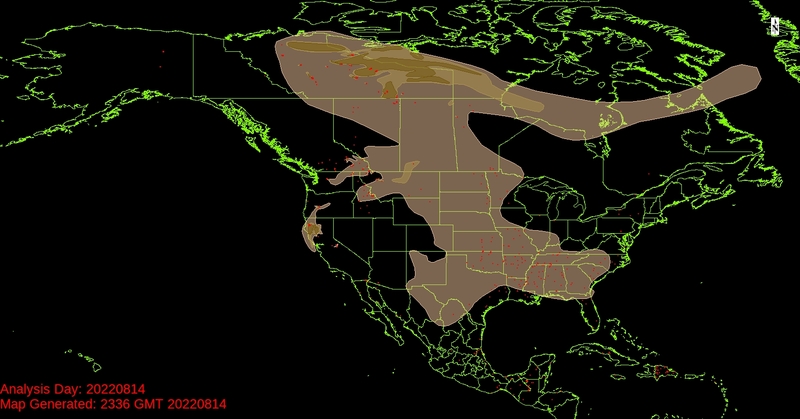 Of course, wildfire smoke in the air impacts air quality, often with significant negative health impacts. For information about air quality, visit AirNow (an Environmental Protection Agency site) to get local air quality information and smoke advisories, as well as links to NASA satellite images of smoke cover and other useful information. The US Forest Service has an Active Fire Mapping Program, and its website shows current large fires across the country. The site also provides links to various imaging resources. Here’s today’s map; both the Mesa and Rattlesnake Creek fires – 53 and 54 – are listed below the map in the table of fires but unfortunately were cut off in the screenshot. And if all of this weren’t depressing enough, we’re also experiencing drought conditions here in Idaho. The West Central Mountains are “abnormally dry” and portions of Idaho – the panhandle and the southwest and southeast corners – are experiencing moderate drought. One last link, the the National Interagency Fire Center’s “fire info-maps” page which provides lots of internal and external links, in case you want to follow me down this rabbit hole of information about wildfires, smoke, and climate as it impacts our lives. And if you’re planning to travel anywhere in the West in the next several weeks – until autumn’s rains and snow arrive and this year’s wildfire season finally ends – check these and your own favorite resources to make sure a wildfire doesn’t block your route and that you can actually reach your destination.